Known as the artist who ‘paints without a paintbrush’, Hong Yi, or ‘Red’, is the Malaysian-born artist that the world first noticed on social media before she went viral with her creative art made up of unorthodox materials and everyday objects — think teabags, coffee mug stains, bamboo chopsticks and even recycled mobile phone glass backs. In her latest installation Aurora, which launched in Hong Kong’s very own art hub H Queen’s last month, Hong used 2000 smartphone glass backs by the Huawei smartphone e-brand HONOR to create art that depicts the earth’s luminous phenomenon as well as reflect (quite literally) the viewers that peer at the piece, illustrating ourselves in the digital age that we live in. We caught up with the architect-turned-artist to find out where she gets her inspiration and why she thinks today’s artists are no longer confined to the four walls of a gallery. Hong Yi is a Malaysian-born artist and architectural designer known as ‘Red’. How did it all start? When did you begin to get a feel for this style of art? I developed it when I lived in Shanghai. Once I chanced upon wholesale markets, a whole world of affordable materials in bulk suddenly became accessible to me, so I started to create art installations during the weekends and documented them through photos and videos. In your opinion, who does your art appeal to? I think my art appeals to a wide range of people, from children to adults, to people in and out of the art world. Perhaps it is because I use ordinary items that everyone can relate to in some way. I am inspired to give people a different way of looking at their surroundings, challenging them to look at the world with fresh eyes. We are starting to see more contemporary artists (like yourself) look to brand collaborations in order to sustain their share of voice. What are these opportunities like? I can’t express how grateful I am to work with brands that trust my vision. Admittedly, at the start of my career, I was worried about collaborating too much with brands and being seen as a ‘commercial artist’. However, five years into doing this full-time, I’ve learned that these brands support me so I can continue to do what I do. I am also very careful and selective of the brands I choose to work with. In 2014, Jackie Chan commissioned her to create a portrait of himself made from 64,000 chopsticks for his 60th birthday. Do you think today’s artists are able to represent themselves through both artistic and commercial communities? Artists are not confined to the four walls of a gallery or museum space anymore, and are no longer controlled by gallerists or dealers. With the rise of social media platforms, I feel that there has never been a better time for artists and designers to share their work: They have full control of how they want to be seen, and what kind of work they want to do. It will be interesting to see how these tools will shape the art world — millennials are the first generation to grow up with the Internet, and this will change how things have been done. I’ve seen artists who have balanced art and commercial work. An example would be Takashi Murakami, who works in fine arts and commercial media – he’s known for blurring both worlds. He had a long collaboration (13 years) with Louis Vuitton. Their first collaboration was a series of handbags, and that was a major commercial success. Much of your work uses sustainable materials, what do you think about industrial waste and up-cycling in general? We can definitely make use of what is perceived as industrial waste and translate it into art with some imagination. In the past couple of years, I’ve received comments about incorporating recycled materials into my works. Since then, I have become more mindful of what I’m using in my projects. In Hong’s recent installation, Aurora, about 2000 recycled glass backs of HONOR smartphones were used. Which piece of artwork are you most proud of? I have many favourites — it’s like picking a favourite child! I’m really happy with the way [my recent installation] Aurora turned out. The challenge with that project, as with many of my previous ones, was that I did not know the material [smartphone glass backs] much, so it took some time to come up with something I was happy with that really highlighted the uniqueness of it. I draw my inspiration from travelling – it challenges me to see the world and life from a bigger picture. I’m also inspired by emotions through music. That evokes memories and feelings and makes me want to turn that into art. Any artists that have inspired you? Oh, so many. . .off the top of my head now, Chuck Close [the American artist known for his large-scale photorealist portraits]. I’m inspired by his work ethic; he just gets to work and doesn’t complain. And of course, I love his work too. 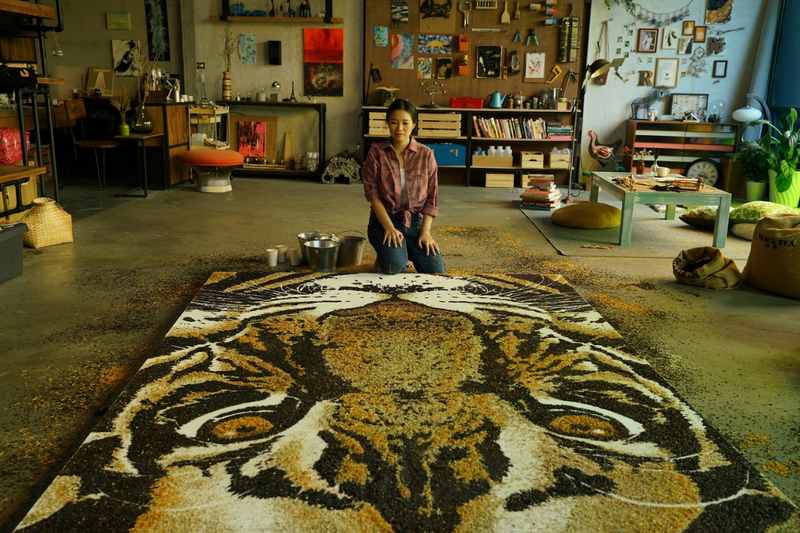 One of Hong’s first pieces is this tiger portrait made with five types of tea leaves: black tea, chrysanthemums, osmanthus, tiger lilies, and rose buds. Besides art, do you have any other passions that you work on? I love reading – I’m hoping to reduce time on the Internet after dinner so I can turn to my books more. I’ve also recently been very into cooking. I just made a taco from scratch tonight! Any goals for the near future? Or any other projects you’re working on? A solo exhibition. I must get to it! And maybe a hike in Nepal.